So… we received an e-mail from Dave this week giving us his estimate of our expenses for this mission trip, which includes getting us where we need to be, lodging, and the cost of the actual things we’ll be doing while we’re there (projects, places we’ll go with the campers, etc.) It isn’t too far off from what I had estimated myself, but it was more. My previous estimate was already pretty overwhelming, so I found myself feeling a little discouraged that morning. I just really hate the fund-raising aspect. I hate asking people for money, I hate the feeling that I get that some people think we’re trying to get them to pay for some sort of family vacation, I hate everything about it. I know I should view it as giving people an opportunity to contribute to world missions when they are not able to travel themselves, but that’s not really how it feels. So, I sent a text to two of my prayer friends just asking them to pray that God will provide, and that I will not allow myself to doubt or question that. I know in my mind and believe that He will (because this is His plan), but today I’m feeling weak. Here’s the cool part… are you ready for it? Later the same day, I get a call from Ben who has just found out that his stipend for coaching baseball hasn’t been added to his paychecks yet, meaning there will be a lump sum addition to his next check. Now, I’m thinking that this news could have come weeks ago or at the end of the year. But it didn’t. It came today, when I read the update on our expenses and was feeling a little overwhelmed at the task of saving/raising that much money. It came today, when I humbled myself enough to admit that I was struggling and asked my friends to pray. I know there are some who would say that is just a coincidence, but I find that a little far-fetched. There’s still a long way to go, but my faith is feeling stronger. Thanks for praying, friends. Thank you, God, for showing me how much you have this under control, even though you shouldn’t have to prove yourself to me. I’m hearing the “Oh you of little faith” message loud and clear. This entry was posted in Preparing for the Journey and tagged financial support, financial update, fund-raising, God's faithfulness, mission trip, prayer, prayer support. This last week has included some further discussions about our upcoming trip to Poland and some action steps towards preparing for the journey. It also brings some specific things that we’d like to ask you to be praying about. First, we exchanged some e-mails with David Hatfield about the possible dates and our concerns about some of the travel details – specifically navigating Warsaw and getting to Ostróda with the children! From these communications, we’d like to ask you to pray that God will give us direction about how he wants to use us for His plan while we are there. There are some opportunities to serve that would require a longer stay than we originally planned. On one hand, we have the children with us and the time off work – why not stay longer? On the other hand, it is a long time away from home and other summer activities. Please just pray that God will help us to hear his voice and follow his leading. Another component is that one way we could serve might mean being away from Camp Ostróda for the last few days of the Holocaust Survivors camp, but would allow us to become familiar with some other aspects of the ministry and churches in Poland. Since Ben is now on the board of Polish Christian Ministries, we are feeling pulled toward this even though the Holocaust camp was our original draw to this ministry. The second thing we need your prayers for is our fund raising. Taking a family of four across the ocean is unbelievably expensive. Sadly, the airlines do not discount for flights that lead to expansion of the Kingdom of God. I think they should, but they don’t listen to me. We have been saving and have calculated what we can save between now and our trip. Everything is based on estimates, but we think that we can cover all the trip expenses (ground transportation, food, lodging, administrative costs, passports, etc.) except for the air fare…. but this expense will be significant. We are very grateful for the financial supports we’ve received so far, but we are a long way from meeting our need. We know that money matters are small obstacles to God and He has always faithfully provided, but it is hard not to worry about this aspect. Please pray that we will cast this anxiety on Him and that he will speak to the hearts of those who are able to help. Finally, we ask that you pray for wisdom as we prepare our children for this trip. We want them to understand why we are doing this and what their role is. We also know that they need to have a little understanding of the history of this country, but we need to give them only what they can handle at their young age. Please ask God to give us the words to help them know what they need to know, but protect them from that which is too heavy for them to carry. Thank you for caring enough to read this post and for your prayers as we begin making bigger strides toward spreading God’s Word to the people of Poland. 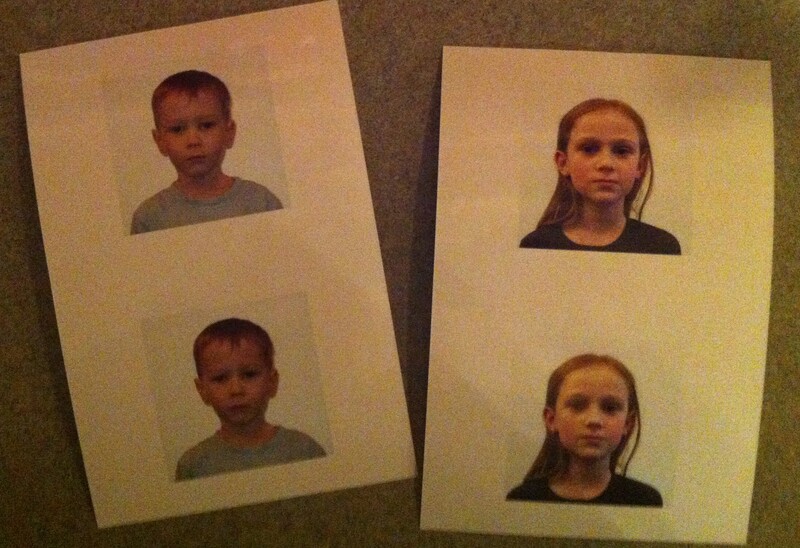 Thank you to Michael Frame at CVS for taking Anna and Ethan’s passport photos. Next step… applications to the post office! You think it’s hard to get a picture of everyone smiling? Try telling them they CAN’T smile! This entry was posted in Preparing for the Journey and tagged Christian, financial support, Holocaust, ministry, mission trip, Poland, prayer request, preparations, wisdom.